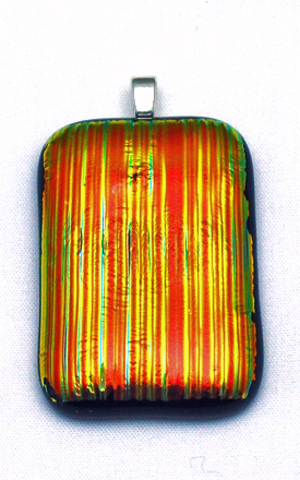 This pendant features a textured pattern of red and golden dichroic glass with subtle little glimmers of green as it moves in the available light. The pendant is designed to be worn on the black satin cord that comes with it or it can be strung on a favorite chain. The bead has a sterling silver bale that is large enough for most omega and similar style chains.